Engine 30 & 50 x 44" built by Christie & DeGraff, Detroit. Boiler iron lined, Firebox, 10'6" x 17", 120# steam. Woods Island, Bay of Isle, Newfoundland. 1878 Built for Duluth, MN, grain trade. 1882 Towed LEM ELLSWORTH, SAN DIEGO, SL WATSON, SB POMEROY. 1885-1907 Towed ALTA & hauled ore, coal. 1885 Iron straps & bands at frame head, double decked, new boiler. Tonnage change to 775.95 gross/564.71 net. 1888, Apr 19 Owned Bewick Transportation Co., Hamtramck, MI. 1891, Jul 24 Owned Jerome B. Zerbe, Cleveland, OH. Reduced to a steambarge. 1892, Apr 15 Owned Ohio & Pennsylvania Coal Co., Cleveland OH. 1894 Wintered Sault Ste. Marie, MI due to unsafe condition of ship. 1900, Apr 16 Owned Alta Transportation Co., Mentor, OH. 1904, Apr 23 Owned August Jean & John J.Boland, Buffalo, NY; changed tonnage to 952 gross/666 net, depth 15.5'. 1905, May 5 Owned Mary E. Jean et al, Buffalo, NY. 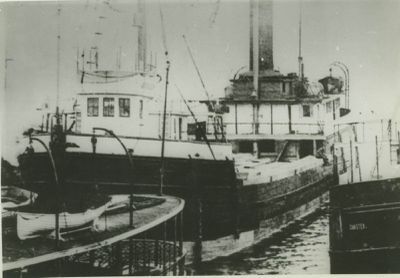 1905 Buffalo, NY, Tonawando harbor, struck obstruction, tearing away wheel, rudder, and forcing a hole in hull near stern. Sunk in 18" water with 700,000 feet lumber. 1906 Fined for carrying passengers. Struck obstruction, Tonawanda harbor, Niagara River, broke several buckets off wheel; cargo lumber. Dry docked for new wheel. 1906, Oct 13 Owned George B. Taylor, Erie, PN. 1907-1911 Towed MARENGO and ED. KELLEY. 1911, May 6 Owned Gorton-Pew Fisheries Co., Gloucester,MA. Taken to Atlantic coast. 1912, Jun Fitted for cold storage. Change tonnage 1,191.54 gross/868.46 net tons, one deck, two masts. Cost approx. $250,000; 196'x 37.4'x 26',500 hp engine, steaming 8 knots/hr. Hold capacity of 1,500,000 lbs. frozen herring. 1912 Sep 9 Two decks. 1913, Nov 5 Burned to water's edge, abandoned at Woods Island, Newfoundland. Documents surrendered.